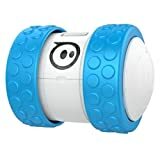 This toy is spherical in shape, and there is a robot fitted inside it, and that is the reason it is called as robotic ball, and Sphero is the name of the company that is making it. This robotic ball can be controlled and operated by many bluetooth enabled devices such as iphones, ipads, tablets and even your android phones and iOS. Also this toy and Ollie (as mentioned below), both can also be controlled by hand gestures, by using Myo Armband. Just buy this product and fully charge it, and download the relevant app and you are ready to go. There are more than 20 different apps, which are free to download, and all these apps can be used to run this robotic ball. 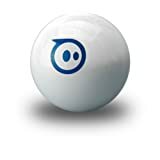 These apps are actually specifically made to operate this Sphero ball, and so once you download any of the apps, the features mentioned in the app can be used to control this rolling ball. Different apps can perform different actions for the ball, and so you will experience this ball in a new and fun way each time. If you are a software programmer and mobile application developer, you can also make your own computer program, to control the ball in your own way, as its open source. The ball is also quite sturdy, and will not fall apart, as its made from high-impact polycarbonite shell. It is also integrated with LED lights, so different apps may sparkle the ball in different colors. The robotic ball also works in water (but faces resistance but can float) as its waterproof. Different games can also be played (using the apps) with this sphero ball in your phone. Also, using some of the apps you can simply draw any shape, with your finger, on your mobile device, and the sphero ball will follow that shape on the floor where it is residing. Lot of exciting things can be done with this awesome toy product. Just watch this youtube video for more details and reviews. This Ollie robot is tubular in shape, and its robust and compact, and two tyre like bands are also fitted, in two opposite sides of the tubular body, for smoother running on the ground. However, the functionality is similar to the Sphero ball mentioned in no.1 above (both toys produced by same Sphero company). It can also be controlled by different free apps, specifically made for it, but you need to make sure that the app is compatible with your phone as all phones are not compatible with the app. You actually need all the latest of Android 4.4.2+ and Bluetooth 4 to use an Ollie. Charger is included in the set, and it may take 3 hrs for complete charging for the first time, for 1 hour use, and after 1 hour, you need to charge Ollie again. Different screen touch buttons on the app can be used to make the Ollie robot to spin fast, turn, move forward and backward, change color, rotate and lots more. Here is a nice video to compare both Ollie and Sphero robots on a single platform. 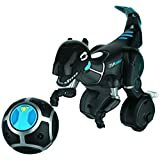 This is another robotic toy (named as MiPosaur) in the shape of a dinosaur, and its functions are better than the two robots mentioned above. Miposaur can be controlled by three free apps (till date), and also it can be controlled by a multi-feature trackball, which acts as its remote control. However, the no.1 and no.2 robots, mentioned above, can only be controlled by mobile apps, and not through any remote control and that is the major difference. You can consider trackball as a rounded ball, with several options on its spherical surface, to control the robot. The dinosaur requires 4 double A batteries, while the trackball requires 4 triple A batteries for its operation, and batteries are not included along with the set. But if you are using a mobile app, instead of trackball, than no batteries are required for the trackball as you are not using the trackball. The app for this toy can be downloaded from different app stores for free. Using the trackball (with 6 different modes) several different actions can be performed, through this dinosaur robot such as dancing, hunting, playing, roaring, annoying, scaring etc. This is all a great fun to watch for small kids. Just pull the tail of the dinosaur, and it will get annoyed and roar, and several such actions can be seen through the six different modes of the trackball and the apps. Just watch the review of this product on this youtube video to get more better ideas.